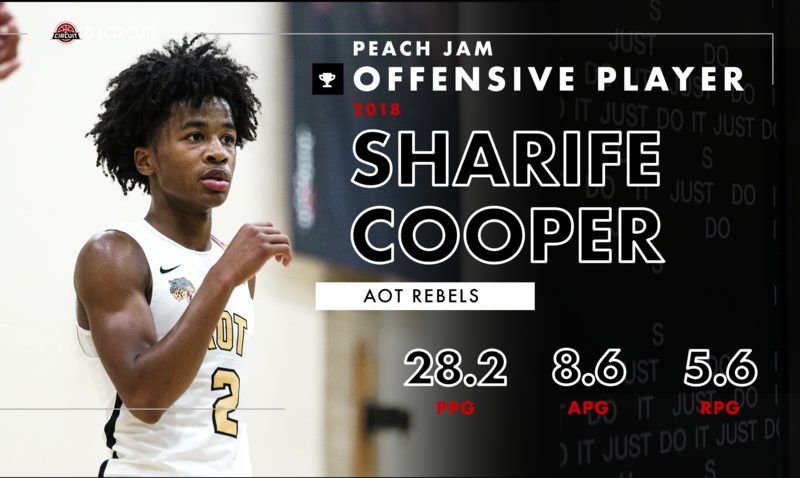 Sharife Cooper put up major numbers as a sophomore, earning EYBL regular season Offensive Player of the Year after a dazzling 16 games. Somehow, he was even better at Peach Jam. Cooper improved his regular season averages across the board, putting up five game pool play averages of 28.2 points, 8.6 assists, 5.6 rebounds, and 1.8 steals. Cooper drilled 2.8 three-pointers per contest, while shooting 88 percent from the free throw line. Cooper's leadership ability was on full display during his offensive onslaught, a run which included three 30-point games. He toyed with triple-doubles in three of their five games, and racked up a 3-1 assist-to-turnover ratio. Cooper has to add to his frame, but he makes up for his soon-to-be non-existent flaw with a lightning-quick release on his jumpshot and his elite floor vision. The 6-foot-2 guard has the ball on a string, and it's apparent colleges are starting to take notice. Cooper recently picked up offers from UCLA & USC, and got the stamp of approval from NBA star Kevin Durant. Cooper shared Peach Jam Top Underclassmen honors with teammate Brandon Boston, who helped Cooper rack up the assists. The 6-foot-6 sophomore averaged 21.6 points alongside Cooper, knocking down three after three as his point guard kept finding him. Cooper has a natural ability to deliver passes precisely to his teammate's shooting pockets, allowing them to knock down shots at a higher clip. His quickness and timing create openings for AOT's entire rotation, and his floor vision allows him to take advantage of those skills. The most exciting part about his Peach Jam performance? Cooper still has one more year in the EYBL, and pending he stays healthy, he'll enter next year on the short list for preseason Most Valuable player.